Though The Winter Road is a fantasy novel, the subtle use of magic and the strong emphasis on plant-based brews used to heighten such things as the senses, strength, and more for fighting is quite unique to the genre. What I loved best about the story was main character Teyr Amondsen, the strong, female ex-mercenary turned merchant who wishes nothing more than to unite The Circle, the collective lands that are ruled by various clans and allegiances, against the growing threat of the warlord Khiese. Though I ultimately mourn for this tragic heroine, her belief in something greater than her own happiness and her example that women are more than makers-of-men is something I applaud and hope more readers can experience. 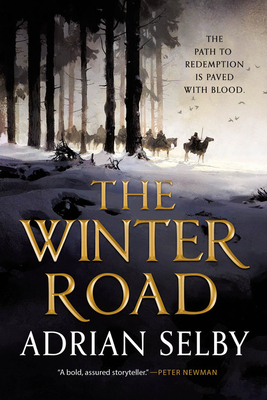 The greatest takeaway from the novel I wish to highlight is this: Adrian Selby’s The Winter Road is a narrative of many things: love, loss, ideals, and above all, sacrifice in the name of peace. The brutally powerful story of a daring warrior traveling a path that might bring salvation to her people...or lead her to ruin. For fans of Mark Lawrence, Andrzej Sapkowski, and Joe Abercrombie. With a merchant caravan protected by a crew of skilled mercenaries, Teyr embarks on a dangerous mission to forge a road across the untamed wilderness that was once her home. But a warlord has risen in the wilds of the Circle, uniting its clans and terrorizing its people. Teyr's battles are far from over . . .